Fishing over the past few months has been excellent here in the Lower Keys. In the winter, depending on the weather, you have plenty of options. So far we have had a fairly mild winter, allowing us to get offshore with regularity and stay on the fish. The tuna fishing started getting good in November and the past couple weeks have been awesome. We do not always have to run far from the dock either, we’ve been catching some nice size fish 6 or 7 miles from home. The wahoo fishing was good around the last full moon and I would expect we see some more fish as we approach this January full moon. Whenever we have been able to get out to the Gulf side to fish, it has been excellent. We had spells of strong south winds this winter and the Gulf of Mexico has provided us protection from the wind and good fishing. Some of the best fishing has been in shallow, around 20 feet of water. We have caught plenty of nice snapper, cobias, kingfish and some big sharks, like bull sharks and tiger sharks. Many of the cobia we have seen have been swimming on the backs of the sharks. The kingfish have been eating live baits on the surface, way back in the chum slick. For the most part, in the winter, the flats are all about the barracudas. We had some big fish cruising around on the flats this year and they have been eating well. When its colder out, the barracudas tend get more fired up and its super fun targeting them on top water lures and light tackle. I’m looking forward to fishing the Cuda Bowl down here, which is on February 1st and 2nd. On the warmer days, we are still seeing some bonefish around, and some of the bonefish have been big. If we get warm spells of weather in February or March, I wouldn’t be surprised if we start to see some schools of tarpon rolling around in the backcountry. The fishing over the past few months has been great here in the Lower Florida Keys. Overall, the weather has been mild and so far this year we have dodged the hurricanes. The offshore fishing has been decent recently, we had a good mahi bite through July, but it died out as the dog days of summer set in. The blackfin tunas started showing up around the last full moon, there were a lot of small fish, but some bigger ones were mixed in. The pilchards have also started to show up along the south side of the Keys. Both the pilchards and the tunas are promising signs for the upcoming fall and winter live bait season. During the summer months, the full day trips were the most successful. Having the ability to run way to the west and fish the deeper reefs really paid off. The mutton Snapper bite on the bottom was excellent and there were plenty of nice black groupers, red groupers, big porgies, amberjacks and other fish. Blackfin tunas, kingfish, mahi mahi and bonitas were also caught on the surface or in the middle of the water column. Usually on these trips, we’re using a combinations of live baits, dead baits and different artificial jigs and lures. Fishing in the backcountry has been awesome the past few months. We have had a lot of small tarpon hanging around the mangroves and in the bait schools. Targeting them with a 9wt fly rod or light spinning gear has been really fun. Those fish should be staying put until the cold fronts start and then they become harder to find. This is also a great time of year to target bonefish and there have been plenty of them around. Not only do we have good numbers of bonefish down here, but late summer and early fall offer great conditions for targeting them with typically sunny skies and light winds. It’s awesome to see big schools of bonefish waking across the flats during the low tides. Well we have had a super wet spring here in the Lower Keys and we just encountered our first named storm of the Hurricane Season. Weather aside, the offshore fishing has been excellent, with some of the best Sailfishing the Keys have ever seen. We had a good push of sailfish in March and now again in May. May is usually late in the sailfish season, but this year all the conditions were right and it turned on. We have been looking for them around the color change and throwing live baits at them. There have been plenty of big blackfin tunas around as well. The dolphin fishing has been decent, we’ve found fish every time we went out, but we haven’t been able to put a big catch together this year. The mahi fishing should just be getting better over the next couple months. Reef and wreck fishing has been consistent. The mutton snapper bite has been excellent this winter and spring. We have caught them on the shallow reefs when the weather has been snotty and there have also been some big ones on the wrecks offshore. There have been blackfin tunas, amberjacks and some rainbow runners on the offshore wrecks as well. The yellowtail snapper fishing on the reef has been decent, usually you can find good action and nice size fish out there. The tarpon fishing in the backcountry has been inconsistent. When we have the right weather the fishing has been good, but when the weather doesn’t cooperate, it makes it harder finding fish. As it is, we have still had plenty of good days, especially with the fly rod. We have hooked a few tarpon on fly this year that have been well over 100lbs. The bite has been the best early and later in the day. The bonefishing around Key West has been excellent, the days when the tarpon are not eating well, we’ve been going bonefishing. Winter fishing is in full affect around Key West. For the last month we have been doing a lot of live bait fishing offshore and around the reef. Pilchards and ballyhoo have been the bait of choice for the most part and they have been pretty easy to come by so far this year. The tuna bite on the offshore wrecks has been excellent the past couple weeks now. We have been able to catch them anytime during the day, but the bite around the evening has been the best. Mixed in with the tunas have been bonitas, rainbow runners, kingfish and amberjacks. Also, when we had nice, clean blue water, the dolphin and wahoo were around. The mutton snappers have been on the bottom around the wrecks too. The sailfishing has not been great, there have been a few fish around, but we haven’t seen any large numbers of fish yet this season. The conditions are right for the sailfish to show up though. Kingfish and cero mackerels are thick around on the reef. We have been catching a lot of them as were yellowtailing, especially when the ballyhoo show up in the chum slick. The yellowtail snapper bite has been consistent and the fish have been nice size. Chunks of bonita and live pilchards have been working best bait for them. There have also been some big mutton snappers on the shallow patch reefs. This is the time of year to catch big muttons in shallow, as they move into the cooler water in the winter. Pilchards and bonita strips will work on the muttons, but live ballyhoo are the preferred bait. For the most part, Barracudas are the main fish we target in the backcountry in the winter. They prefer the cooler temperatures and they actually get more aggressive when it gets colder. They are an awesome fish to target on light tackle or with a fly rod. They will attack the lure or fly violently and they fight incredibly well. It is no easy task catching a barracuda in shallow water. Days when its super windy and hard to get out on the flats, we drift the basins for trout, snapper, ladyfish and jacks. We have also been fishing the backcountry channels with live pilchards and you catch a variety of fish on live bait, from snappers and jacks to barracudas and mackerel. Shark fishing in the backcountry is another fun activity when the wind is blowing. Sorry for the lack of reports recently, were just starting to get back to normal since Hurricane Irma. Thank you to all my clients who made it down to fish in October, I know some people had to change hotels and some restaurants were not fully operational, but your business means everything to this little island. If anyone is hesitant to visit Key West after the storm, don't be. We are ready for the holiday season and the fishing has been excellent. The wind has started blowing from the north now and the tunas have been biting offshore. We were able to get out one evening earlier this week and we caught a few blackfin tunas, plus a couple dolphin. The sailfish started showing up too and hopefully we get a consistent bite throughout the winter. 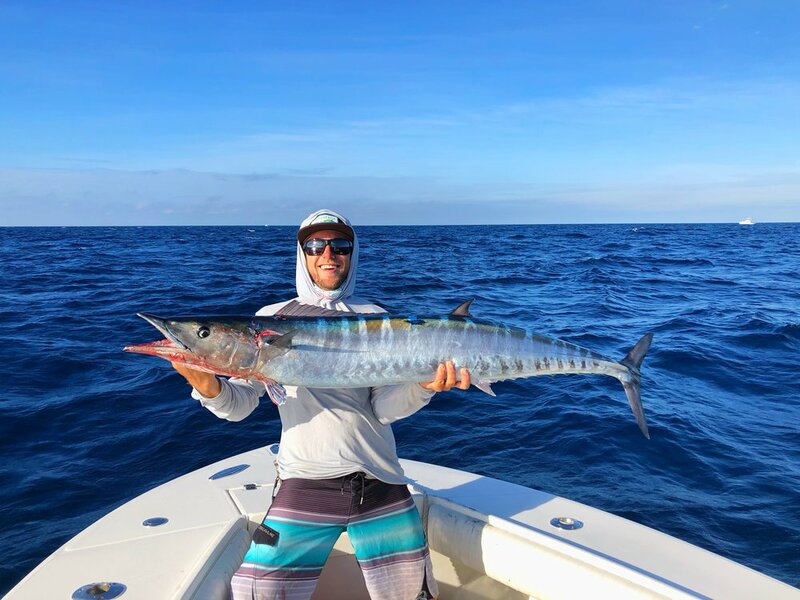 Also the wahoo fishing should be getting good around the December and January full moons, if anyone has interest in live bait fishing for wahoo, that would be a great time. We did a lot of backcountry fishing October, once the water started clearing up after the storm, the fishing turned on in the shallows. There were plenty of schools of small tarpon around. They were chasing bait around the mangroves. We did a lot fishing for them with live pilchards, but you can cast artificial lures and flies at them as well. The bonefishing was also great after the storm, we saw a lot of big schools of bonefish pushing around the flats. Now that the weather is starting to cool down, we have seen less bonefish and we are starting to do more barracuda fishing on the flats. Winter is a great time target barracudas in the backcountry; they like the cooler water temperature. The barracudas have a super aggressive bite, the fight well and they will jump too. They are an awesome predator to target in shallow water with either light spinning gear or with a fly rod. Fishing around Key West in July has been consistent this past month; we probably had the best weather all year, with fairly light winds and sunshine. There has been a lot of little mahi mahi offshore, there are still some big ones around, but not as many as earlier in the season. We fished the Key West Marlin Tournamnet again this year, but we did not do well. We raised a couple billfish, but we couldn’t get one to eat and we pulled the hook on the other one. All we caught were small dolphin; we saw a lot of life offshore, like Dolphins (mammals), Pilot Whales and sea turtles. It was slow fishing for everyone, with only 1 marlin caught in the tournament. Besides the offshore fishing, it has been good around the deep wrecks, we have been catching mutton snappers, amberjacks and a few blackfin tunas. The fish have been eating both jigs and different types of live baits. The big mangrove snappers have been spawning on the reef and they have been biting well too. We have been catching our biggest snappers on live pinfish. July is a great time to fish the backcountry waters surrounding the lower keys. Bonefishing was really good and we saw fish all over the place. I would expect the bonefishing to stay good through the rest of summer and into the fall. 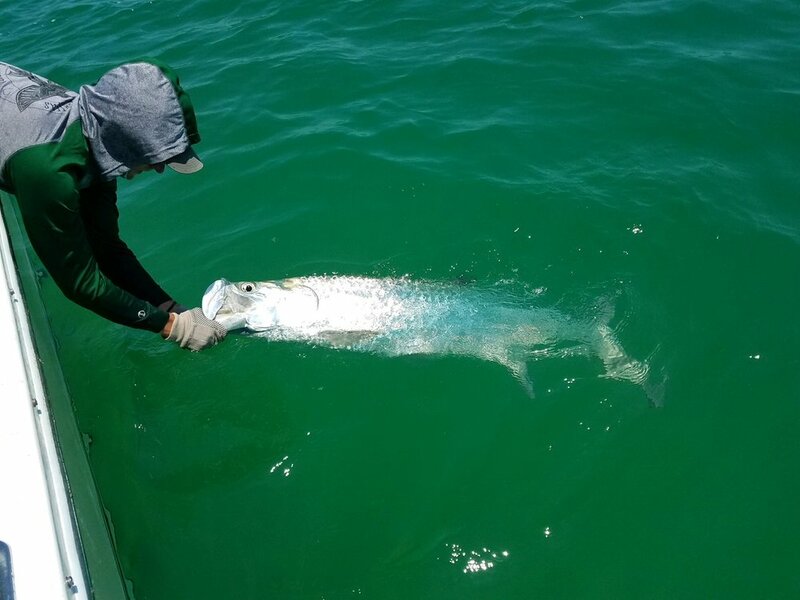 July is also the end of our tarpon season, we will get some fish to hang around as long as it is warm, but most of the big schools tend to take off in July. We still have a lot of smaller tarpon that hang out and we find them around the mangroves, eating bait. They are usually happy fish and it is fairly easy to get them to eat a fly. They are a lot of fun on lighter gear. June was a super busy month here in the Florida Keys, but the weather was not cooperative. For the most part in June I was either fishing for mahi mahi offshore or fishing for tarpon inshore. The offshore bite has been fantastic when we were able to make it out there. The water quality out deep has been much better than last year and the fishing is much better too. There have been a lot of small mahi around with some big ones mixed in. As usual we've found a lot of mahi under weeds and other floating debris, but some of the bigger fish we found were under frigate birds. There have also been some billfish offshore and some scattered tunas mixed in. In the backcountry, the tarpon bite has been the most consistent it has been all year, despite the weather. There have been a lot of fish on the oceanside and the bite has been good, but again the weather has often prevented us from fishing there. We have also had some great early morning and evening bites. The worm hatch was awesome this year, we fished further east from Key West, but there were a lot worms out and the the tarpon were taking flies. The permit fishing picked up in June, a lot of the fish seemed to be done spawning and heading back into the shallows. We saw a lot of permit causing the oceanside flats, mixed in with the tarpon, but there are a bunch of permit in the backcountry as well. We have had some horrible weather this month, it has been cold, windy and rainy, but the fishing has been good when we have made it out. Mahi mahi are starting to show up offshore and the water is looking great, much better than it did last year. The sailfishing has also been good, particularly the past 2 weeks. Flying kites with live baits is the most productive way to fish them. Earlier in the month, the blackfin tuna bite was great, that has slowed up recently, but there are still some tunas around. The tarpon have finally started to show up around Key West, it took them a long time to make it here, but finally they are around. They were not eating well at first, but they have since settled in and started biting much better. We have had a few successful evening trips where we have hooked a few tarpon on Hogy Lures and flies. There have been some big mutton snappers biting inshore too. That has been great because we have been fishing inshore a lot due to weather. There have been some Grouper eating as well and hopefully that will continue this month so we can keep a few and eat them. Overall, the fishing in Key West was good in March, the tuna fishing was awesome offshore, but we did not have the sailfish bite we were hoping for. We did catch a few sails, but not in any great numbers. The afternoon tuna trips have been really popular with my clients and the bite was consistent. Besides tunas, the wrecks offshore have been productive with amberjacks, mutton snappers, rainbow runners and a few african pompano. There has also been a lot of action with kingfish and bonitas as well. The water offshore has looked beautiful and hopefully in April, we will start to see some mahi show up out there. In the backcountry we kept busy catching barracudas on the flats, they have been biting really well. We had a good speckled trout bite in the basins. That was really nice on windy days when working the flats was tough, you can drift the basins and catch trout and other species. When the water has been warm enough, we have seen some permit and bonefish, but March was probably the coldest month this winter. The tarpon have finally started to show up around Key West, we haven't seen any big schools yet, but the fish we have found have been eating. We have had a great month of fishing here in Key West and the winter weather has been cooperative too. The tuna bite offshore has been awesome, typically we have been doing afternoon/evening trips to target the tunas with live pilchards around the offshore wrecks. We have caught plenty of other fish on the pilchards as well, such as bonitos, amberjacks, jack crevalles and mutton snappers. The sailfish bite has been consistent over the last month; we have had a few days with multiple hook ups, including one day when we caught 5 fish out of 5 bites. All the sailfish have been caught on live baits like, goggle eyes, pilchards, and ballyhoo. There has been a lot of action on the reef with some nice mutton snappers and kingfish. We have being seeing a lot fish in the backcountry this past month too. The typical winter species like barracudas, sharks, and jacks have been around, but there has been a good amount of bonefish and permit. The Tarpon haven't really showed up yet around Key West, but any day now we should start to see some big schools of fish popping up. The winter fishing in Key West is in full swing. There have been sailfish, wahoo and tuna around offshore. Leading up to this full moon, we spent most of our time targeting tunas and wahoo on live baits. The tuna bite on pilchards has been fantastic around the wrecks, particularly later in the afternoon. The wahoo have been eating larger live baits, such as blue runners and they have been around the edge of the reef. We have had some very breezy weather this week and some of the trips haven't made it offshore. Instead we fished some of the inshore rock piles and patch reefs. The mutton snapper bite has been good around the nearshore rock piles. Most of them have been eating live pilchards or ballyhoo. As a bonus, the porgy bite has been red hot around the patch reefs too. The backcountry fishing has been good, when the weather has been warm enough there have been some bonefish around. This week with the colder weather though, we have been seeing more barracudas on the flats. The basins have been holding a lot of life, from snappers to trout to jacks. The mud slicks have been thick and we've also been seeing the jacks chasing schools of ballyhoo around the backcountry. Fall fishing has been great so far around Key West. We're getting some heavy winds this week and next week, but the fishing has been good if you can handle the rough conditions. The tunas have been biting well on the wrecks, both on live bait and on vertical jigs. There have been a few sailfish showing up and hopefully this weekend we will be targeting them. In the backcountry we have been targeting bonefish and the bite has been great. There have been some groups of small tarpon chasing baits around in the backcountry and they are a lot of fun on smaller gear. I got back from New Jersey this past week, I was fishing a tournament up there. We caught some nice Yellowfin Tunas up to 70lbs, but nothing big enough to put us in the money. The fishing up there was great and I had a lot of fun. Since Ive been back, I'm been mostly fishing the back country, looking for Bonefish. The Bonefish are definitely thick down here and they are eating flies real well. We have also seen a bunch of Permit around too. Starting to slow up and do a less charters this time of year, but we have still been doing some fishing. The Cobia fishing in the Gulf has been great. There has been a bunch of small fish around, but there have been plenty of keepers too. The Mangrove Snappers bite on the reef continues to be great. The backcountry fishing has been good as well. We fished the Marquesas a few days ago and there were pods of Tarpon popping throughout Mooney Harbor. We had a few Permit and Bonefish shots as well. Just getting back into normal chartering after the Key West Marlin Tournament. The tournament was a great time and and we wound up finishing in second place overall with a White Marlin and a Sailfish. We caught a few Mahi as well, but they did not qualify because they were small. I did one charter yesterday. We started out on the wrecks and caught a few Amberjacks and Bonitas. Then we went out and did some deep dropping with electric reels and that worked out great. We caught 1 Snowy Grouper and 3 Big Yellowedge Groupers. We spent the last few days fly fishing on the flats. We spent a good bit of time looking for Tarpon, we had some decent shots, but no hook ups. There are still some tarpon around, but we are seeing a lot less fish then last month. Thats to be expected as we get to the end of season, but there should still be some fishing hanging around for the next month or so. We did see a lot Permit last week and we got a few of them on live crabs. I've also been doing a lot of deep dropping offshore from 500 feet to a 1000 ft. Thats been great, there has been a lot of Golden Tilefish, Blue Line Tiles, Snowy Groupers and Rose Fish. We've had a few schools of Mahis come around the boat when we've been deep dropping and we got a few of these on fly and lite spinning gear. They didn't have much size to them though. I have been doing a lot of fly casting the last few days with the guys from badfishTV. Over the last four days we have hooked 8 Tarpon on fly and got 3 to the boat. The Tarpon fishing has been great and we were seeing a lot of fish. We also hooked 1 Permit that broke us off, but we were focusing most of out efforts on Tarpon. I have not fished the last couple days due to Tropical Storm Colin, but the Tarpon fishing was pretty good before that. The storm definitely through the Tarpon bite off, but it should be back on track later this week. The bite offshore had been pretty slow slow still, there had been some Mahi around, but not as good as it typically should be this year. Hopefully the storm mixed things up and brought some fish in. We had been seeing a lot of Bonefish around on the flats too and that should continue well into the fall.